Earth and Mars both undergo ice ages. These are recurring periods when deposits of ice and snow expand beyond the polar regions to reach areas closer to the equator. During an ice age, average global temperatures are colder, and thick deposits of ice — glaciers — grow and move into non-polar regions. Typically, these leave distinctive features on the landscape. Scientists can use such features to identify an ice age even long after the ice itself has vanished. 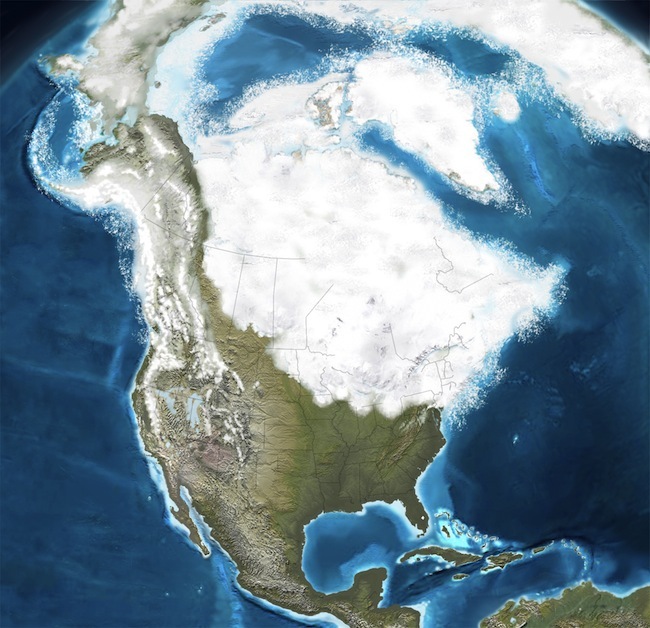 During the last 2.5 million years, continent-size ice sheets have advanced southward in North America and Europe numerous times. These advances occurred at intervals of about 40,000 to 100,000 years. Between these long, cold glacial periods came shorter and warmer interglacial periods. We are living during an interglacial that started about 12,000 years ago. That's when the climate began to warm, and existing ice sheets, which covered most of Canada and much of the northern United States, began to melt away. The same happened to glaciers all over Earth. Earth's ice ages have produced major changes in climate, sea level, and surface features. For example, the most recent ice age created the Great Lakes in the Midwestern United States, and more locally, glaciers gouged out the Finger Lakes of New York state. Glaciers also pushed up long, low ridges of sand, gravel, and clay to the south of what is now Connecticut. When the ice sheets melted, sea level rose about 100 meters (330 feet), and those ridges eventually became a part of New York state. You know it as Long Island. On Mars, evidence of past ice ages includes: glacier ice covered by rock and dust on slopes and in valleys, and buried ground ice at latitudes where ice cannot exist at the surface. Other telltale signs are winding ridges that may be deposits of sand and gravel left by streams flowing beneath glaciers, and long ridges of sediments that resemble those pushed out in front of terrestrial glaciers. What causes ice ages? In the case of Earth, scientists are not sure exactly what triggers an ice age to start. Several factors appear to be involved. These include the effects of the Moon's gravity on Earth, changes in Earth's orbit around the Sun (including its axial tilt), variations in the Sun's brightness, ocean currents, changes in the atmosphere's composition (make up), movements of tectonic plates, impacts by big meteorites, and large volcanic eruptions. These events combine to create what scientists call Milankovich cycles, named for the Serbian geophysicist Milutin Milanković, who discovered them. But it's a difficult problem to solve. Earth's many natural systems work together in complex ways that scientists understand only partly. In the case of Mars, the situation appears a little simpler. Besides the lack of a massive ocean and hydrosphere, the most important factor relating to Mars is that it has no big moon such as Earth has. Scientists theorize that our Moon's gravity stabilizes the tilt of Earth's axis relative to our planet's orbit around the Sun. Earth's axis now tilts at 23.4° and the Moon's effects keep the tilt between 22.0° and 24.5°. This sets limits on how much incoming sunlight — perhaps the most important force in climate change — can vary over each area on the Earth. However, the two Martian moons, Phobos and Deimos, are much too small to stabilize Mars' axial tilt, so it can vary much more. Scientists therefore look to "astronomical" causes such as axial tilt, orbit shape, and orbit orientation as the major factors controlling climate and ice ages on Mars. Currently, Mars' axis tilts at 25.2° — by coincidence similar to Earth's. But computer calculations, or models, show it can tilt from as little as almost 0° (upright) to a high value of more than 80° (way over on its side). According to scientists, such an extreme range of axial tilt produces gigantic swings in climate. Calculations show the axial tilt of Mars cycles once every 2.5 million years. Other orbital properties also change periodically. For instance, currently, the southern hemisphere has warmer summers because Mars is closest to the Sun at the time of the southern summer solstice. But this changes on a 51,000-year cycle. And regular shifts in the shape of the Martian orbit — its eccentricity — cause the seasons to have different and varying lengths. 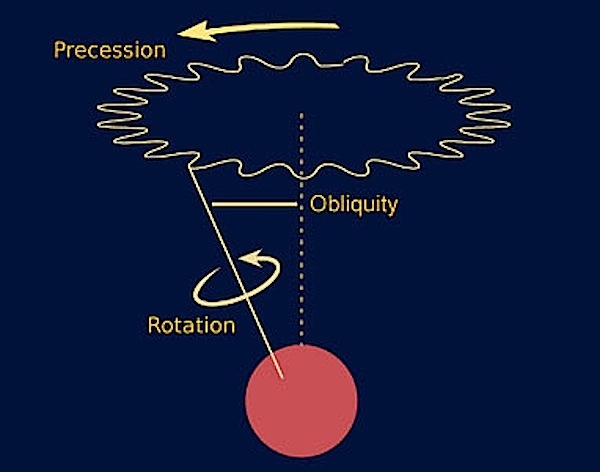 In step with the axial tilt, eccentricity varies on a 2.5 million year cycle. 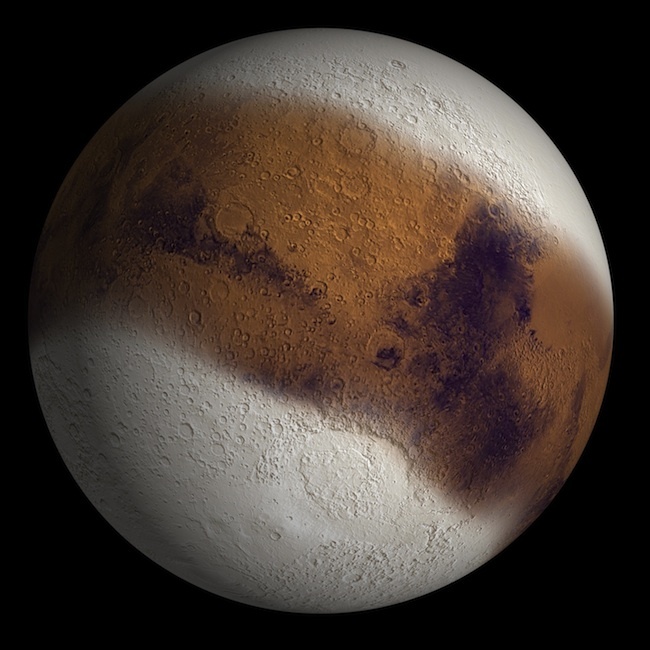 However, computer simulations of Mars' tilt and other astronomical factors can predict accurately only for a geologically short time — about 60 million years into the past or future. That is the time span over which scientists can say that Mars had a specific axial tilt at a specific time. When they try to predict values over a longer span, the errors grow too large. But even if scientists can't say what Mars' axial tilt was 2.3 billion years ago, for example, the calculations still have some value. Why? Because running the simulations for much longer times beyond what is strictly predictable lets scientists estimate the maximum and minimum range of changes that Mars has gone through. This is how they found the extreme limits for its axial tilt. What happens in a Martian ice age? When the planet's axial tilt is low (such as today), polar regions are cold and the equatorial zone is warm. This produces a thin atmosphere with most of its CO2 locked up at the poles as CO2 ice. The same goes for water. This is the Mars we currently see. 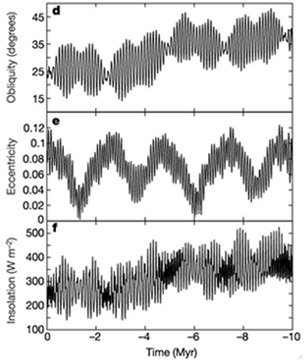 But at high axial tilts, however, polar regions face the Sun more directly. They experience long, warm summers and become the warmest areas on Mars. This kicks off a sequence of changes. The warmth causes polar CO2 ice and water ice to sublimate (change directly from a solid into a gas, skipping the liquid phase). This loads the atmosphere with CO2 and water vapor, making a thicker atmosphere. The thicker atmosphere is warmer and wetter (more humid) because both CO2 and water vapor are greenhouse gases. The thicker atmosphere also raises the surface pressure, possibly allowing liquid water at the surface. Once it is in the atmosphere, the water vapor circulates in global patterns similar to Earth. It then condenses as ice and snow at the now-cold lower latitudes. Water vapor seeps into the soil and freezes as ice in the ground. Scientists calculate that much water could be stored as ground ice at latitudes near the equator during a Martian ice age. As Mars' axial tilt slowly swings once again more upright, the polar regions cool down and become colder again, while the equatorial zone grows warmer. This drives water out of the near-surface layers and back into the atmosphere. From there it will migrate to the coldest regions — the poles — and condense to make ice caps once again. Most of the CO2 also cycles back into the ice caps, leaving only a thin atmosphere. Changes like these operate over timescales of hundreds of thousands to even millions of years. One calculation suggests that over the past 5 million years, polar water ice has spread toward the equator and gone back more than 40 times. Discoveries of fresh ice exposed in the bottoms of small recent impact craters suggest the last Mars ice age is still retreating. The craters with ice lie at latitudes (around 40° north) that are too warm for subsurface ice to be stable for very long. Scientists argue that finding shallow ice deposits at these latitudes suggests the ice is a remnant of the last ice age that has not yet disappeared entirely. In exploring ice age changes, scientists familiar with Earth's polar regions note features on Mars that resemble ice age ones seen on Earth. These include patterned ground (polygonal terrain), glaciers, moraines, and eskers. Other ice-related features seen on Mars are lobate debris aprons and lineated valley fill. These may have terrestrial analogs as well.